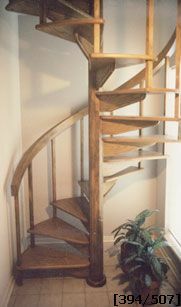 64" diameter, white oak, wood staircase. The handrail is # 231 (2"x 3 1/2"); the balusters are a # 334 (1 1/4" square); and the treads are # 142 (1 1/2" thick) with nosing. The center column is a 5 1/4" diameter with a custom shape. This staircase was assembled at our plant piece by piece and was cut and drilled for a perfect fit. After the staircase was been built, it is sanded smooth, numbered and disassembled and then package for shipment.